Babak Azizzadeh, MD, FACS is a facial plastic surgery expert in Beverly Hills and attracts rhinoplasty patients both nationally and internationally to the CENTER for Advanced Facial Plastic Surgery. He understands each person has a unique face and takes a holistic approach to rhinoplasty procedures. Dr. Azizzadeh provides each rhinoplasty patient with a customized treatment plan. He helps a rhinoplasty patient bolster the appearance of the nose and ensures the nose complements a patient’s facial features. That way, a patient can reap the benefits of a rhinoplasty procedure that enhances his or her cosmetic appearance. Rhinoplasty, also referred to as a nose job or nose surgery, is a cosmetic procedure designed to reshape the nose to create an overall improvement to the facial aesthetic. It also is used to modify the shape of the nose or improve the nasal function. Dr. Azizzadeh is board-certified in otolaryngology (head and neck surgery) and facial plastic and reconstructive surgery, and his unique expertise provides him with a complete understanding of the complex underlying structures in the head and the nose. As such, Dr. Azizzadeh ensures each patient will receive the best-possible aesthetic outcome without putting his or her breathing at risk. What Is the Goal of Rhinoplasty? The goal of rhinoplasty is to reshape the nose and ensure the nose complements the face, eyes, cheeks, and chin. Ultimately, rhinoplasty helps an individual improve the balance of facial features, leading to increased self-confidence. A rhinoplasty may be used to eliminate facial features such as a “bump” on the bridge of the nose or a “bulbous tip” that draws attention away from the eyes. The procedure has been shown to help patients enhance facial symmetry, improve the shape and/or size of the nose and remove imperfections on the bridge of the nose. As a result, rhinoplasty proves to be a very impactful procedure for those who want to improve the appearance of the nose and bring harmony to the face. Dr. Azizzadeh is a top primary rhinoplasty surgeon in Los Angeles who has performed facial rejuvenation procedures on celebrities, international dignitaries and many other prominent patients. The best rhinoplasty results vary based on the individual, but Dr. Azizzadeh’s approach to nose job surgery always remains the same. He learns about a primary rhinoplasty patient, then customizes a nose job to accommodate a patient’s treatment goals. Dr. Azizzadeh next performs a natural nose job, monitors a patient’s recovery and works with this individual to produce the best nose job results. What is a Natural Looking Nose Job? The answer depends on an individual’s anatomy, ethnicity, gender and other factors. To create a nose that matches the face, Dr. Azizzadeh will evaluate a patient’s bone structure, lips and chin. Each of these facial features needs to be in balance with the nose to create a well-balanced facial aesthetic. The eyes should be the focal point of everyone’s face. Therefore, Dr. Azizzadeh’s goal is to achieve this for his rhinoplasty patients. When someone looks at you and their focus naturally goes to your eyes, that is the result of a successful rhinoplasty outcome. Achieving a natural-looking nose requires a long-term commitment from both Dr. Azizzadeh and his primary rhinoplasty patient. Before a nose job, Dr. Azizzadeh studies a patient’s facial appearance and learns about this individual’s treatment goals. If Dr. Azizzadeh believes rhinoplasty surgery can deliver a natural-looking nose, he develops a custom nose job treatment plan for a patient. Or, if Dr. Azizzadeh believes rhinoplasty surgery should be performed in combination with other facial rejuvenation procedures, he crafts a patient’s treatment plan accordingly. Enhanced Facial Symmetry: With primary rhinoplasty, patients can improve facial symmetry and ensure that the nose appears symmetrical relative to the cheeks, chin and other facial features. Long-Lasting Cosmetic Improvements: Helps patients improve nose size in relation to facial balance, nose width, a nasal tip that is enlarged or bulbous and other nasal issues. Correction of Birth Defects: For individuals who were born with malformations of the nose, surgery helps repair and alleviate these issues. Correction of Sinus Problems: When performed in combination with sinus surgery, rhinoplasty helps patients fix breathing problems and chronic sinusitis. Improved Breathing: Sometimes, a nose job is performed to eliminate breathing difficulties. Dr. Azizzadeh is happy to provide patients with insights into rhinoplasty and its benefits. By doing so, Dr. Azizzadeh helps patients determine whether a nose job is the best course of action. Dr. Azizzadeh is one of the most sought-after facial plastic surgeons in the world because his results are so beautiful and he puts compassionate patient care as a top priority. Visit the gallery below to view before and after photos from some of Dr. Azizzadeh’s rhinoplasty patients. From a cosmetic perspective, you are a candidate for rhinoplasty if you feel the need to improve the appearance of the nose. If a patient does not like the appearance of the nose or has suffered nose trauma, Dr. Azizzadeh can help. Dr. Azizzadeh will teach the patient about rhinoplasty, respond to each patient’s concerns, and ensure he or she understands the benefits of nose surgery. Teenage rhinoplasty is available to help teens address cosmetic and structural issues of the nose, but this procedure should not be performed until a patient has stopped growing. For teenage girls, surgery can be performed as early as 15 or 16 years old. Meanwhile, for teenage boys, surgery can be completed at 16 or 17 years old. Additionally, male rhinoplasty is a form of nose surgery designed specifically for men. The procedure helps men improve nose symmetry and repair structural defects of the nose. It also helps men enhance their facial appearance, resulting in increased self-confidence. Dr. Azizzadeh also understands that patients of different ethnic backgrounds have distinct facial features and nasal structures, and he performs an ethnic rhinoplasty procedure that accounts for a patient’s ethnicity. With this procedure, Dr. Azizzadeh ensures patients of all ethnic backgrounds can benefit from a natural-looking and properly functioning nose that complements the facial appearance. Dr. Azizzadeh possesses comprehensive knowledge of each ethnic group’s nasal features and works with patients to help them achieve their desired results. Regardless of ethnicity, Dr. Azizzadeh always ensures a patient’s nose fits harmoniously with the eyes, cheeks, chin and other facial features and brings balance to the face. If a patient does not like the appearance of the nose or has suffered nose trauma, Dr. Azizzadeh can help. Dr. Azizzadeh is a top Los Angeles nose job surgeon who will teach the patient about their options, respond to each patient’s concerns and ensure he or she understands the benefits of primary rhinoplasty surgery. Prior to a rhinoplasty procedure, Dr. Azizzadeh performs a comprehensive patient evaluation. At this time, Dr. Azizzadeh learns about a patient’s medical history and treatment goals. He then determines whether this individual is a viable candidate for nose surgery and offers appropriate treatment recommendations. Why Is Rhinoplasty One of the Most Complicated Procedures? You can feel confident that these risks are as low as possible in the hands of Dr. Azizzadeh because he has dedicated his career to performing safe and successful natural nose job surgeries. Dr. Azizzadeh focuses on providing patients with well-proportioned and naturally beautiful noses and works with each patient to deliver personalized support. This enables Dr. Azizzadeh to offer custom surgery options to each patient and ensure he or she is fully supported. Check out the video below to learn more about how a primary rhinoplasty can deliver natural results for patients and how Dr. Azizzadeh helps each patient create the perfect nose for his or her face. A consultation with Dr. Azizzadeh is a personal and unique experience. First, Dr. Azizzadeh will ask the patient to explain exactly what it is about the nose that he or she would like to improve, how long he or she has had these concerns and what his or her expectations are for nose job surgery. Dr. Azizzadeh spends as much time as necessary getting to know the patient so that he can understand his or her cosmetic objectives. From there, Dr. Azizzadeh will examine the patient’s nose and facial features, including the lips and chin. Dr. Azizzadeh boasts an in-depth knowledge of facial harmony and provides his patients with the best possible approach to rhinoplasty. In addition, Dr. Azizzadeh will use the Vectra 3D imaging system to take 3D photographs of a patient’s face and review the face from all angles. The Vector system allows Dr. Azizzadeh to alter the appearance of the nose on a screen and use images to highlight the expected outcome of a natural-looking rhinoplasty. Dr. Azizzadeh will help patients understand all their cosmetic options. He educates patients on the underlying causes of their cosmetic complaints, along with how each treatment option will address those issues. Since many patients from around the world come to Beverly Hills to receive a nose job from Dr. Azizzadeh, he also offers Skype consultations. To learn more about Skype consultations, please call our office at 310.657.2203. Dr. Azizzadeh takes a detailed and precise approach to rhinoplasty and believes there is no such thing as a standard nose job. He examines every aspect of the face, carefully taking note of each facial issue so that it can be addressed during nose surgery. 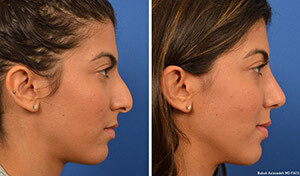 Moreover, Dr. Azizzadeh performs a structure-based rhinoplasty that respects the patient’s nasal framework. He will work to maintain and improve the underlying structures of the nose to sculpt a beautiful outcome for every patient, every time. This allows Dr. Azizzadeh to deliver the best nose job results. Rhinoplasty is usually an outpatient procedure that is performed under general anesthetic, which means the patient is asleep during surgery. However, Dr. Azizzadeh recognizes that each nose is different, and the techniques he uses vary from patient to patient. Dr. Azizzadeh may utilize an open or closed surgical approach based on the level of complexity and the areas of the nose that need to be addressed. Open nose job surgery allows a greater degree of precision from the plastic surgeon if the tip and middle portion of the nose need to be modified. Closed nose surgery, on the other hand, involves alterations made from the inside via the nostrils. This technique is excellent for individuals who require “bridge” modifications. The video below uses a 3D animation to illustrate how a rhinoplasty is performed and the benefits of a nose reshaping procedure. What you would like to achieve from nose surgery? Are you looking to restructure the bridge of your nose? Change the shape of the tip? Alter your nostrils? How do you feel about nose surgery and the recovery time from rhinoplasty? How much improvement are you expecting to achieve? Dr. Azizzadeh is a trusted Beverly Hills facial plastic surgeon who has performed thousands of nose surgeries throughout his career. He will address all the patient’s concerns before surgery and ensure the patient has realistic expectations for outcome of their procedure so that the patient feels 100% comfortable and confident before surgery. A nose job surgery has an initial recovery time of one to two weeks, during which time the patient will wear a nose cast and experience bruising and swelling around the nose and eyes. Following the surgery, Dr. Azizzadeh will see the patient several times in the first 10 days. The patient will then be evaluated every three months for one year and annually afterwards. The follow-up may be done via Skype if the patient lives outside the Beverly Hills area. Rhinoplasty, unlike all other cosmetic procedures, requires a long-term commitment by the plastic surgeon and the patient to ensure a successful outcome. Full rhinoplasty results will typically be seen in one to two years. Patients with more complex surgery, revision rhinoplasty surgery, advanced tip work and thick skin likely will see the final results after two years. Dr. Azizzadeh will explain what to expect from the healing process in greater depth during your consultation. Clean your incisions with hydrogen peroxide once a day. Use antibiotic salves on incisions and just inside the nostrils twice a day. Cold compresses or frozen peas should be placed gently over the eyes and cheeks for the first three days following surgery. After three days, use a warm compress on areas that have persistent bruising. Keep head elevated for at least one week following surgery. This includes while you sleep, rest or relax. Avoid vigorous exercise for at least three weeks after surgery. At The CENTER for Advanced Facial Plastic Surgery, our goal is to ensure you can enjoy a comfortable, smooth recovery after a rhinoplasty procedure. If any questions or concerns arise during your rhinoplasty recovery, we are here to help you immediately. Why Is Dr. Azizzadeh Considered One of the Top Rhinoplasty Surgeons Worldwide? Dr. Azizzadeh has been a top choice for rhinoplasty patients because he constantly goes above and beyond the call of duty to support patients and is happy to work with each patient to guarantee his or her rhinoplasty goals are met. Also, Dr. Azizzadeh prioritizes patient satisfaction and dedicates the necessary time and resources to assist patients. He uses the latest rhinoplasty surgery techniques and offers patients a broad range of nose surgery options. Plus, Dr. Azizzadeh invests in state-of-the-art tools and equipment to guarantee his patients can receive best-in-class support at all times. What are the different types of nose jobs? Primary Rhinoplasty: The most common form of a nose job, this procedure allows a patient to improve his or her nasal proportions, restore facial harmony and/or correct nasal asymmetry. Teen Rhinoplasty: Performed exclusively on teens, this procedure is used to fix structural defects of the nose, enhance the size or shape of the nose and improve the facial appearance. Male Rhinoplasty: This procedure helps men enhance facial symmetry, improve the shape or size of the nose, correct nasal bridge issues and remove the bulbous tip of a nose. Ethnic Rhinoplasty: Designed for non-Caucasian patients, this procedure accounts for the unique facial features associated with a patient’s ethnic background. It enables a non-Caucasian patient to improve the appearance of the nose without putting his or her ethnic facial features in danger. Revision Rhinoplasty: This procedure is used to correct subpar results following a primary rhinoplasty or repair aesthetic and/or functional nasal problems that arise after an initial nose job. Nasal Reconstruction: This procedure is used to treat nasal deformities that occur after an individual experiences skin cancer, nasal collapse, trauma to the nose or other nasal issues. Dr. Azizzadeh ranks as one of the best rhinoplasty surgeons in Los Angeles. He performs a comprehensive patient evaluation before a nose job. Next, Dr. Azizzadeh tailors a primary rhinoplasty treatment plan to his patient. He then discusses a patient’s rhinoplasty options and helps this individual select the best nose job treatment. What’s the difference between rhinoplasty and septoplasty? A rhinoplasty is used to reshape or resize the nose. Conversely, a septoplasty is used to straighten the nasal septum due to a deviated septum, which makes one nasal passage smaller than the other. As a top septoplasty and rhinoplasty surgeon in Los Angeles, Dr. Azizzadeh performs various nose and facial rejuvenation procedures. Dr. Azizzadeh’s goal is to help a patient achieve a natural-looking nose that matches his or her cheeks, chin and other facial features. Therefore, he can discuss both septoplasty and rhinoplasty procedures with a patient. If a patient qualifies for septoplasty or primary rhinoplasty surgery, Dr. Azizzadeh then develops a personalized treatment plan and performs the requested procedure. Dr. Azizzadeh also requests follow-up appointments with a rhinoplasty patient to ensure his or her recovery stays on track. Can a rhinoplasty surgeon also fix a deviated septum? A deviated septum may make it tough to breathe through the nose, and septoplasty is commonly used to treat this issue. A septoplasty procedure enables Dr. Azizzadeh to straighten crooked cartilage and bone in the nose. It helps a patient improve his or her breathing, as well as the sinus function. Also, septoplasty may help a patient reduce snoring. A rhinoplasty and a septoplasty are not identical. With rhinoplasty, an individual can reshape or resize his or her nose. The procedure does not, however, allow an individual to correct a deviated septum. In some instances, a septoplasty and rhinoplasty may be performed in conjunction with one another. This procedure, called a septorhinoplasty, allows a patient to simultaneously correct a deviated septum and enhance his or her facial symmetry. For individuals who want to address a deviated septum, a consultation with Dr. Azizzadeh is key. At this time, Dr. Azizzadeh can help a patient determine if a rhinoplasty, septoplasty or septorhinoplasty is necessary to correct a deviated septum. Can rhinoplasty help with sinus problems? Rhinoplasty surgery has been shown to sometimes help patients improve their airway function. If a patient is dealing with an airway obstruction, he or she may suffer from nosebleeds, sinus infections and other nasal issues. With a rhinoplasty, a patient may simultaneously correct such issues and improve his or her facial appearance. Before a patient undergoes a rhinoplasty, it is important to consult with Dr. Azizzadeh. During a rhinoplasty consultation, Dr. Azizzadeh learns about a patient and his or her treatment goals. Plus, Dr. Azizzadeh performs an in-depth patient evaluation to determine the best course of action. 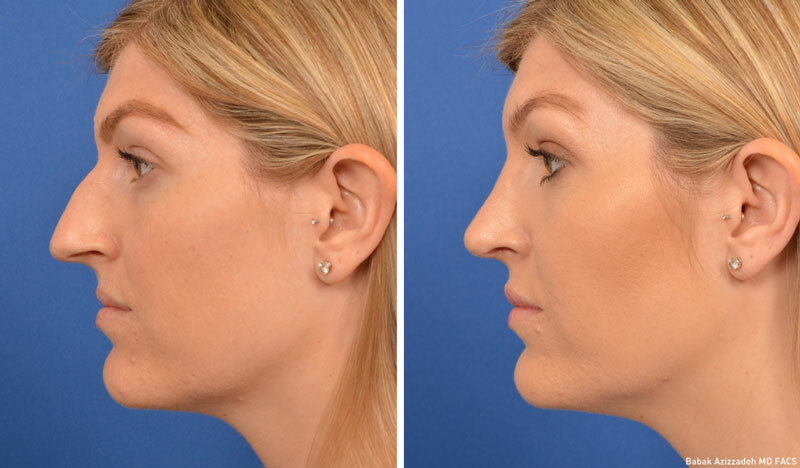 If Dr. Azizzadeh determines a rhinoplasty can help a patient achieve his or her functional and cosmetic treatment goals, he next outlines the procedure and develops a personalized treatment plan. Or, if an alternative treatment is necessary, Dr. Azizzadeh will provide a patient with full details about various alternative treatment options. What is the ideal age to undergo a rhinoplasty? There is no ideal age to undergo rhinoplasty surgery. To determine if now is a good time for nose surgery, it is crucial to consult with Dr. Azizzadeh. During a consultation, Dr. Azizzadeh analyzes a patient’s facial features and medical history and finds out why he or she is considering rhinoplasty surgery. If Dr. Azizzadeh believes a patient is a good candidate for nose surgery, he crafts a custom treatment plan for him or her. Or, if a patient does not qualify for nose surgery, Dr. Azizzadeh offers alternative treatment options. Nose surgery is usually performed under general anesthesia; general anesthesia enables a patient to sleep during the procedure so they don’t feel anything. Following surgery a patient will be subscribed pain medication to help manage any pain in the first few days after surgery. After nose surgery, a patient may experience bruising and swelling around the nose and eyes. These symptoms generally last for one to two weeks and disappear on their own. Are there risks with getting a nose job? Dr. Azizzadeh is a Beverly Hills rhinoplasty surgeon who wants his patients to understand all aspects of treatment. He teaches a rhinoplasty patient about potential risks associated with surgery before it is performed. Also, Dr. Azizzadeh helps a patient prepare for rhinoplasty recovery. Because if a patient understands what to expect following a primary rhinoplasty, this individual can take the necessary steps to achieve the best-possible results from a natural nose job. A rhinoplasty patient needs to limit his or her physical activity for approximately four to six weeks after nose surgery. The initial nose surgery recovery period ranges from seven to 10 days; after this period, a patient can resume everyday activities like working or going to school. Meanwhile, a rhinoplasty patient should forgo strenuous activities like jogging or yoga for up to three weeks after surgery and avoid heavy lifting for up to four weeks following treatment. He or she also should receive medical clearance before resuming a regular exercise or workout regimen. The best nose job results occur if a patient understands the rhinoplasty recovery process. Dr. Azizzadeh wants Beverly Hills rhinoplasty patients to prepare for nose job recovery and details the recovery cycle prior to treatment. He offers instructions about post-rhinoplasty surgery care and provides recovery support. Dr. Azizzadeh is also ready to respond to a patient’s nose job concerns or questions at any point during the recovery cycle. Does a nose job leave scarring? During a closed rhinoplasty, all incisions are made inside the nostrils. Thus, there is no risk of external scarring after the procedure. Comparatively, during an open rhinoplasty, a facial plastic and reconstructive surgeon makes a small incision across the columella. The incision is usually made in the shape of an upside-down “V,” and as such, is virtually invisible following surgery. Dr. Azizzadeh is often considered one of the best rhinoplasty surgeons in Los Angeles, thanks in part to his devotion to his patients. He does everything possible to minimize scarring during rhinoplasty procedures. As a result, Dr. Azizzadeh frequently performs a natural nose job that results in little to no scarring. Is it possible to minimize scarring after rhinoplasty surgery? Generally, rhinoplasty patients should protect the nose from the sun for the first few months after surgery. Excess sun exposure sometimes causes skin pigmentation changes that can make scars more noticeable following rhinoplasty surgery. Dr. Azizzadeh does everything possible to limit scarring after rhinoplasty surgery. He also provides instructions to help a patient properly care for his or her nose and further reduce the risk of scarring. How long does it take for your nose to heal after a nose job? A patient typically experiences the full results of a rhinoplasty within one to two years of treatment. For complex nose jobs, revision rhinoplasty surgeries and advanced nasal tip procedures, the full results may be visible after two years. How long will the results of a rhinoplasty surgery last? The results of rhinoplasty surgery are usually permanent. However, as a person gets older, his or her facial appearance may change due to the natural aging process. Can a rhinoplasty be performed in combination with other facial rejuvenation procedures? Facelift: Reverses the visible signs of aging in the face and neck. Eyelid Lift: Eliminates bags from the lower eyelids and/or excess skin from the upper eyelids. Brow Lift: Treats sagging skin on the forehead, restoring a youthful contour to the upper portion of a patient’s face. Neck Lift: Reduces or removes loose neck skin, excess fat in the lower face or chin and other visible signs of aging in the face and neck. Dr. Azizzadeh wants to help each of his patients achieve a balanced, natural-looking facial appearance. If Dr. Azizzadeh believes a patient can benefit from a facelift performed in combination with different facial rejuvenation procedures, he will tailor his patient treatment plan accordingly. What happens if a rhinoplasty fails to deliver the desired results? If a rhinoplasty causes functional issues that affect the nose or a patient is not satisfied with the results of nose surgery, revision rhinoplasty surgery is available. A revision nose job is used to correct the results of a prior nose surgery. The procedure is complex and must be performed by a highly trained facial plastic and reconstructive surgeon like Dr. Azizzadeh. Is rhinoplasty surgery right for me? To find out if rhinoplasty surgery is the best choice, schedule a consultation with Dr. Azizzadeh. A rhinoplasty consultation allows a patient to learn about nose surgery, how it is performed and its short- and long-term results. Plus, the consultation allows Dr. Azizzadeh to find out if a patient qualifies for rhinoplasty surgery. Perhaps best of all, a patient and Dr. Azizzadeh can work together during a rhinoplasty surgery consultation to weigh the pros and cons of treatment. Primary rhinoplasty may be completed to enhance the shape of the nose and ensure that the nose is proportional to other facial features. It also may be used to correct structural defects (i.e. problems related to a deviated septum, breathing issues, etc.) and restore nasal function. Or, rhinoplasty may be performed to correct breathing problems related to the nose, as well as address nasal issues associated with birth defects or trauma. Dr. Azizzadeh is ready to help you achieve your rhinoplasty goals. With Dr. Azizzadeh at your side, you can move closer to improving the appearance of the nose, boosting your self-confidence and much more. Ready to book a consultation with Dr. Azizzadeh? To learn more about our rhinoplasty surgery options, please contact The CENTER for Advanced Facial Plastic Surgery in Beverly Hills to schedule your consultation with Dr. Azizzadeh. We even offer phone or Skype consultations for out-of-town patients. Rhinoplasty, or nose surgery, is one of the most commonly performed facial plastic surgeries worldwide. The size and shape of your nose has one of the biggest impacts not only on your appearance but also how others perceive you. Most people choose rhinoplasty surgery to improve the appearance or function of the nose. Who is an ideal candidate for nose plastic surgery? What is recovery from nose reshaping like? When will you notice the final outcome of the handiwork of your rhinoplasty specialist? How do you find the best rhinoplasty surgeon? The blog reveals everything you always wanted to know about rhinoplasty. One of the most common questions posed to a rhinoplasty specialist is, “What is the recovery like after nose surgery?” The answer to the question depends on the person, as every rhinoplasty patient mends in a fashion that is unique to them. But there are some generalities with regard to recovery from primary rhinoplasty. You will be able to return to work 7 to 10 days after nose surgery. At 3 to 4 weeks, you will be ready for the big reveal of your nose plastic surgery to your family and friends. At 1 ½ months, approximately 80% of your swelling will have resolved, while the last 20% takes place over 1 to 2 years, revealing a beautifully symmetrical nose. Your rhinoplasty before and after is now complete! What comes to mind when you think of ways to fight aging? Most people think of cosmetic procedures such as facelifts, liposuction, and injections of fillers for wrinkles, not nose surgery. The nose is the principal component of your face, and if it’s too large or crooked, it can add years to your appearance. Yes, with a pinch here and a tuck there, rhinoplasty can turn back the hands of time, providing you with a more youthful presence. With the best rhinoplasty surgeon, nose reshaping can be the foundation of your anti-aging program. Nose plastic surgery, or rhinoplasty, is one of the most requested facial plastic surgery procedures among both women and men. Today, as many as 1 in 4 rhinoplasty surgeries are males who choose elective nose surgery for either improvement in appearance or improvement in function of the nose. Whether male or female the primary rhinoplasty technique remains the same, but you, and more importantly your rhinoplasty specialist, must understand that fundamental differences in the nose amongst the genders. The very best rhinoplasty surgeon will provide a highly customized roadmap for your male nose reshaping experience. The decision to pursue nose surgery can be daunting, especially when searching for the best rhinoplasty surgeon. Many people restrict themselves to a local rhinoplasty specialist, overlooking the possibility that their rhinoplasty surgery may be best performed by a physician practicing in another city or even another state or country. The world is much larger than your neighborhood or the city where you currently reside and with technological advancements, such as FaceTime and Skype, your rhinoplasty consultation can be conducted via your phone or the Internet. So, don’t let your current locale dictate your choice of rhinoplasty specialist, as many are discovering this alternative to a traditional in-office rhinoplasty consultation.